Every day here at RevZilla we talk about moto gear and the intricate nuances that sets each piece apart from their contemporaries in the market. We are all about it! Fit, form, function and feel are what we are all about! Gear that is properly built to for our unique needs on the road is essential and we pour through the technical aspects of each peace like it is our job… because it is our job! At the same time, however, each piece of gear has another dimension that cannot be weighed, counted, or tangibly measured at all. We can talk technical specs all day, and they are incredibly important, but lets not kid ourselves into thinking that the emotion conveyed by our gear doesn’t matter too. It’s a little something called style. For those looking to indulge their throwback, vintage roots both on and off the bike, the new Roland Sands Barfly Perforated Leather Jacket will leave you and your style monster thoroughly appeased. The Barfly Perf is constructed out of Roland Sands’ signature Airborne Leather that is proprietarily treated in such a way as to significantly soften the leather without giving up tensile strength. After air-drying for four days, it is then hand oiled and waxed so that it achieves a one of a kind finish to stand out in a crowd. For comfort, the jacket has been designed with a relaxed fit and pre-curved sleeves, as well as a rolled collar opening for those who do not like the Euro collar snaps at the base of their neck. At the same time, however this jacket is not just for show as it comes armor ready with pockets at the shoulders, elbows, and back which will fit specially made RSD branded Forcefield armor. Attitude and character are to the Roland Sands line like Hydrogen and Oxygen are to water. They are essential elements. 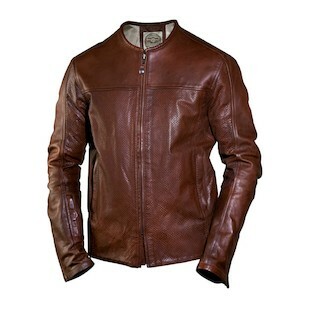 This riding season if you are looking to quench your thirst for classic moto style and functional utility, check out the Barfly Perforated Jacket from Roland Sands Designs.